Origin: The pawpaw is native to the temperate woodlands of the eastern U.S. Hardy to USDA Climate Zone 5. Common Name: Pawpaw, Paw Paw, Papaw, Poor Man's Banana, Hoosier Banana, etc Fruit: The pawpaw is the largest edible fruit native to America The tree you get are growing in 3.25" pots. Common Name: Pawpaw, Paw Paw, Papaw, Poor Man's Banana, Hoosier Banana, etc. Origin: The pawpaw is native to the temperate woodlands of the eastern U.S. The American Indian is credited with spreading the pawpaw across the eastern U.S. to eastern Kansas and Texas, and from the Great Lakes almost to the Gulf. Fossils prove the pawpaw is indigenous to the U.S. The deep winter dormancy of the tree makes it highly frost tolerant, withstanding temperatures of -25 F or lower (hardy to USDA Climate Zone 5). Pawpaws can be grown as container specimens, although this is not often practiced. A deep pot is needed to accommodate the root system. 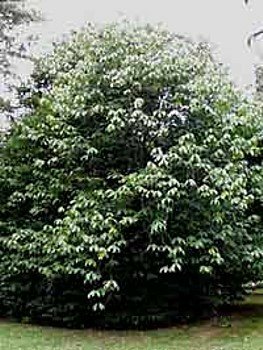 The pawpaw is a deciduous, often narrowly conical tree growing from about 12 feet to around 20 feet. Fruit: The pawpaw is the largest edible fruit native to America. Individual fruits weigh 5 to 16 ounces and are 3 to 6 inches in length. The larger sizes will appear plump, similar to the mango. Pawpaw fruits often occur as clusters of up to nine individual fruits. The ripe fruit is soft and thin skinned. The trees you get are growing in 3" pots. They are about 7 inches tall.